These days i wrote some code to dig into packet radio. I started with some coding to implement KISS (keep it simple and stupid) that was invented in 1987 by KA9Q and K3MC. It is a small protocoll that is similar to the Serial Line Internet Protocoll. It is used to transfer HDLC data over a asyncronous serial interface. KISS adds some capabilities to control some radio parameters for wireless transmissions. At the picture you see the result so far. 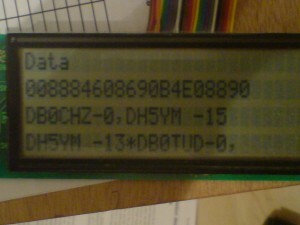 Data can be received via the serial line. The SLIP decoding is done (removing FEND´s), control parameters are extracted. In addition the path in the header of the transferred AX25 frame is decoded and printed to the display (which is just for understanding all the stuff). My goal is to design a small KISS/SMACK terminal node controller that can interface a HDLC modem or even do the AX25 frame generation on its own. For sure, just for doing some APRS stuff less memory would be sufficient.